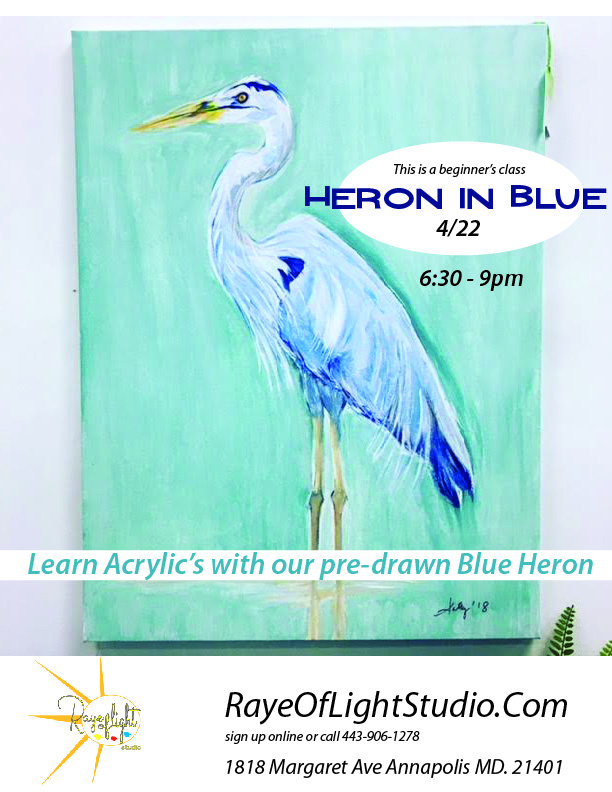 Heron in Blue is just for all of you, who want a better paint class experience. Love blue herons…who doesn’t , they remind of us of the beach and salt life! This medium is so forgiving and the perfect place to start if it’s been awhile since you painted or maybe even never have…?! You will be able to concentrate on just the painting process for the heron is pre-drawn for you. Learn how to use the acrylic medium, working from dark to light. Create some fun – learn to paint all the feathers…be fancy give your bird it’s own personality. Take home a 16 by 20 Big Blue Heron for your home or beach house – we will teach you how. All materials and our step by step instruction included for this 2/ 2.5 hour class . We provide aprons and free parking…and as always you can bring your own food/drink into the studio.